Quesadillas were perfect directly from the freezer! I made this freezer meal for my September exchange and meant to post this recipe ages ago. Better late than never! I try to use seasonal produce because I'm making my meals in bulk and I want to buy top quality ingredients locally as much as possible. This meal is especially easy for the Summer since you don't have to use the oven to heat anything up, but it's great during any season. The quesadillas can be cooked directly from the freezer on an iron skillet. It was so easy! The recipe that I based this from used corn and since the salads had corn, I decided to use sweet potatoes and sweet peppers since I had so many peppers this time of year from my produce delivery. I diced the sweet potatoes very small the same size as sweet potatoes and cooked them on a skillet in olive oil with no seasoning, just a bit of salt. I used the Chile and Onion Trader Joe's tortillas. You have to be very careful with tortillas that you buy if you're shopping in traditional grocery stores because of the funky ingredients so I always buy ours at Trader Joe's. I made 30 quesadillas on a large non-stick griddle. I made the salsa verde with roasted tomatillos, onion, and jalapenos seasoned with lime, honey, cumin and salt. To cook quesadillas, warm them on both sides in an iron skillet. Cut in wedges and top with salsa and sour cream. Homemade Tomatillo Salsa packs with the quesadillas. On Labor Day weekend, I had trouble finding fresh corn in Indiana since it was a bit late in the season. But I found an Amish produce stand where I picked up two dozen ears of corn by my in-laws lake house. I used one dozen for the freezer meal salads and the other dozen was for us to keep for the winter. I cut the corn off the cobs, then cooked the kernels in boiling water. You can also use frozen corn for this recipe since you're going to put it right back in the freezer if you make this in the off-season. I cooked dried black beans in the slow cooker, which is my favorite method. Check out my post. 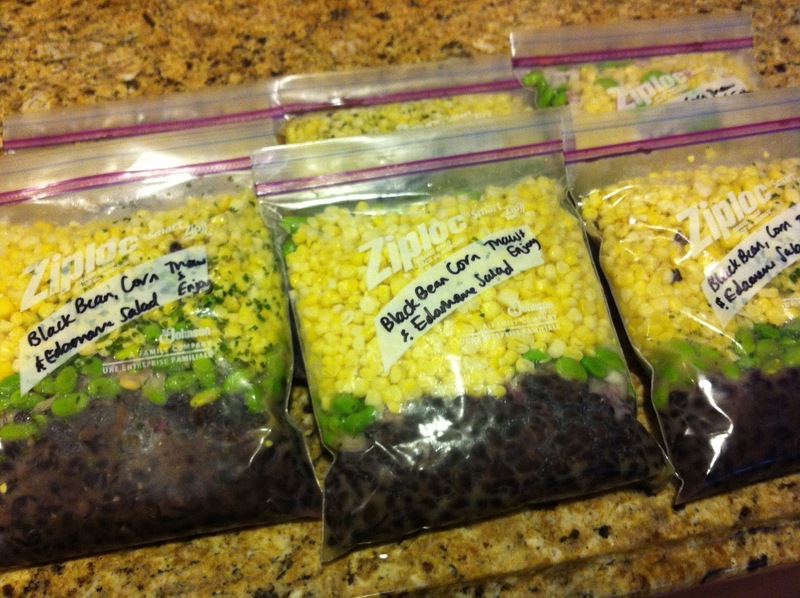 If you use a 14oz can of black beans for each salad, make sure you rinse and drain it first. I always cook my own beans because you end up opening up way too many cans. Plus, it's more eco-friendly and budget conscious if you cook your own dried beans. You will need 1 1/2 cups for each batch for the recipe below. These were very rich so I made two batches for the 6 meals so people would have a small sweet after dinner. I used a nice quality dark chocolate from Trader Joe's for the brownies. They were amazing! I hope you enjoy these freezer meal posts. I really enjoy freezer cooking and our monthly exchanges. 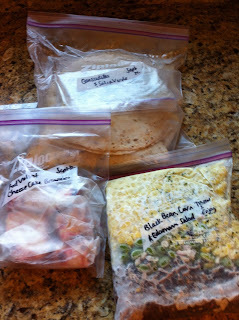 I usually set aside a couple weekends a month to make my meals on the weeks that we're home. Sometimes I have help from Ava and other times Aaron will entertain her outside while I'm cooking. Then we average a freezer meal per week, which we reserve for a Monday or Tuesday night.